A car bombing of an outdoor market in Sadr City killed at least 63 people and left even more injured. 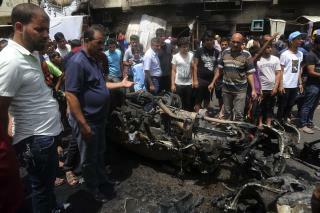 In northern Baghdad, a suicide car bomb in the neighborhood of Jamiya killed seven and wounded 22. A suicide car bomb at a police station in Baghdad's northwest Kadhimiyah neighborhood killed 18, of whom five were policemen. The attack also wounded 34. Thank you President Bush for starting this whole *ucking mess. Interesting. None of the free sources are reporting this. 88 killed here 32 killed in Belgium which got more press. just putting it in perspective.